Well, it’s official, my most favourite-ist place outside of my home country is Japan. I don’t know why I haven’t been back here since I first came in 2000, I’ll definetly be visiting more in the future. My Japanese is pretty rusty, I haven’t really practiced or studied it for about a year, but it’s coming back to me in droves. The customs guy at the airport pulled me up, saying ‘Hello, could you please open your bag’, to which I replied ‘Konnichi wa’. We then chatted in Japanese about the weather, where I learnt Japanese and where he thought I should go in Tokyo. He then let me pass, bag unchecked! Tokyo was my first stop, as I had never been there. I stayed in a fantastic little hostel right in the heart of Tokyo. They say Tokyo is the most expensive city in the world, but I don’t agree (Dublin wins the award for that, in my opinion). The hostel I stayed at cost just 2000 yen per night – about half what I was paying in London. 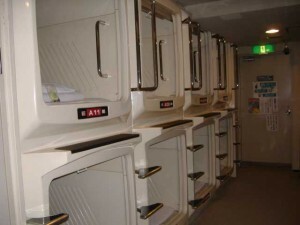 I also spent one night in a capsule hotel – something I just had to experience. Because trains finish up early, many Japanese business men (and women) miss that last train, rather than catch a taxi home (can be extremely expensive, particularily in Tokyo), they created the capsule hotel. In the room where I was, there was a long wall full of ‘capsules’ – tiny rooms, about 1 meter high and a bit over 2 meters long. In each capsule, there was a bed, tv, radio, light and tiny holes in the wall for a book and so forth. On another level, there was a [women only] traditional Japanese bath room. It really was suited to a person who misses the last train – they give you a towel, facewasher and pajamas. In the bath there was shampoo, conditioner, toothbrushes, everything for free. Lots of fun, very Japanese. Next stop was Kobe, where I visited another of my host sisters. Asako came out to Australia in 2001 and spent 6 months living with us. It was great to see Asako and meet her family. Asako took me to see Kobe, where we spent most of our time wandering around, shopping and seeing the sights. The highlight of the visit was definetly the time spent around the dinner table – listening and talking with her family, watching her grandfather do magic tricks and listening to the concert they put on for me (Asako’s sister played the keyboard, Aunt played the piano, Cousin played the flute and Asako worked wonders with the xylophone). It was hard leaving, but I’ll be back! Of course, I’ve been enjoying the Japanese food too. Gyoza – Japanised Chinese dumplings – is probably my favourite, but sushi, gyuudon, yaskisoba and takoyaki are up there too. 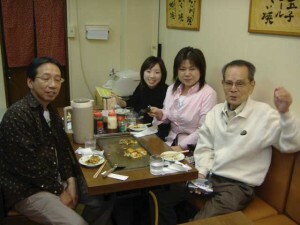 The food is reasonably cheap too, about $5 or $6 for a sit down meal, as long as you know where to go. I love being able to order food and know exactly what it is you’re eating. That said, it doesn’t always work out that way – the other day I wandered into a resturant, looked over the menu and realised I only understood one thing – yakisoba. That was fine, I thought, I love yakisoba. But when I ordered it, I was told it wasn’t available. Glancing over the menu again, I decided not to risk it and point, but rather to ask the waiter for his suggestion. He raced away and came back with a delicious dish, but I’m still not sure what I ate! Well kiddies, I’m now ready to go back to Tokyo for a few more days, then I head for home. What a fantastic year, I’ll miss the traveling, but am quite looking forward to having my own bedroom, a bathroom where I can leave my shampoo and a kitchen where I can store stuff… And of course my family, friends and pets! Its really a great post but i will differ at one thing with you and that is Dublin is the expensive city of World i think Tokyo wins in this regard.I have come across various cities but the prices here are so high,even the people living there also express the same thing it may be due to the buying power of people bcz when people have buying power,prices automatically increase.